ExRotaprint began in 2004 as a tenant initiative. The location’s general lack of prospects while stuck in the redevelopment line, as well as the resulting state of disrepair the site had fallen into over the years, were the essential factors for setting the project in motion. Initiated by artists Daniela Brahm and Les Schliesser, the tenants’ association, ExRotaprint e.V. was founded on August 31, 2005. The goal was to purchase the property. As tenants we saw ourselves as the actual investors. The managing board of the association handled the purchase negotiations and was the contact representative for city politics and the public. At the outset, the fight to successfully develop a project from the “bottom up” was entirely open-ended and making it a reality was only possible with tenacity, our own ideas, political pressure, and finally also with the support of the district and state. After successful purchase negotiations, the association decided to establish the non-profit ExRotaprint gGmbH, which today develops the complex for which it alone is responsible based on a ninety-nine year heritable building right. 2002 – Responsibility for the former Rotaprint site is transferred from the district of Wedding over to the Liegenschaftsfonds Berlin (LiFo). The main objective is to sell the site for the highest possible price. The LiFo is not prepared to manage the site with existing tenants; the administration falls apart within a short period of time, it is then outsourced, which leads to numerous turnovers in property managers and building superintendants. 2003 – The LiFo commissions a property value assessment for the former Rotaprint site. A fair market value of 2.18 million euros is established. 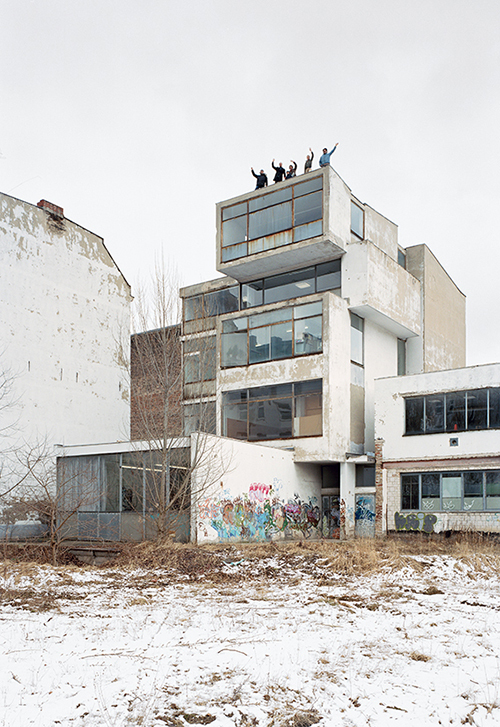 2004-2005 – Les Schliesser and Daniela Brahm conceive a plan for taking over the complex through on-site tenants. The goal is to sign an option agreement with the Liegenschaftsfonds Berlin in order to take over the administration of the site, to develop a commerically viable approach for it, and to actually purchase it within two years. In order to give legitimacy to the negotiations and to have a platform for representing the interests of tenants throughout the process, Daniela Brahm, Les Schliesser, and Anna Schuster begin an on-site campaign to establish a tenants’ association. Of the approximately forty rental parties on site at the time, seven tenants are ready to form the association and become members. During the process that followes, the association temporarily expands to include twelve members; at times as many as twenty-two people attend meetings, on other days there are only three. October 13, 2005 – Appointment at the Liegenschaftsfonds Berlin with Mr. Lippmann. Following the 2003 property assessment valuation, the LiFo sets the purchase price at 2.4 million euros, and rejects an option agreement; according to its own statement, the LiFo is not contracted to develop the property but to sell it. The LiFo requests ExRotaprint to make an offer. October 1, 2005 – ExRotaprint makes a bid of one euro for the Rotaprint site in LiFo’s public call for bids. According to LiFo’s statement, the public call for bids without a minimum bid serves to establish the market value of the property. November 5, 2005 – ExRotaprint is the only bidder, the start of LiFo’s negotiations with ExRotaprint; the LiFo introduce to the table the possibility of a heritable building right. ExRotaprint goes along with this idea, but does not rule out the possibility of purchasing the site outright. February 15, 2006 – Appointment with the LiFo at the Senate Department for Economics to negotiate the property value as basis for establishing the interest rate of the heritable building right. The LiFo sets the property value at 989,000 euros. The price to take possession of the buildings is one euro. To assess the site’s financial viability, ExRotaprint is granted access to the financial records for 2004-5. The records are to be made available in June 2006. March 13, 2006 – The Senate Department for Economics communicates to LiFo its consent to ExRotaprint’s acquiring of the heritable building right and the calculation bases for the interest rate. The per annum rate for the contract is set at ca. 4.8% of the land value (in view of the mission to promote productive businesses and artists), or ca. 45,000 euros annually. June 2006 – To our surprise we learn about the package sale of forty-five state-owned properties, which, parallel to our negotiations, LiFo had drawn up at the instigation of an Icelandic holdings group (“Berlin im Paket” (Berlin Package Sale)). Without notifying ExRotaprint and without an official announcement, the Rotaprint site is “resolved.” ExRotaprint is given no opportunity to react to the package sale. July 2006 – A written request is sent to Mr. Lippmann to withdraw the Rotaprint site from the package. The LiFo justify its suspending of negotiations with ExRotaprint on the grounds that a sale has clear priority over a lease—even though ExRotaprint had never ruled out the possibility of purchasing the site. August 2006 – Letters are sent out to all members of the Senate and House of Representatives with the urgent request to withdraw Rotaprint from the package sale. August 29, 2006 – Arrival of the 2004 and 2005 financial statements for assessing the financial viability of the site, which was granted during lease meeting discussions in February (with LiFo and the Senate Department for Economics). September 2006 onward – Analysis of the 2005 financial statement, release of the actual operational and heating costs, release of the actual average net base rent costs, additional consultation by administrative parties regarding subcontracting agreements, and overview of the extreme price differences in rental contracts. The finding: actual operating costs eat up almost all the net rental income. October 2006 – An application is sent to LSK Berlin for a micro-project grant (10,000 euros) to defray some of the costs for running the project; due to the ongoing package sale receiving the grant is doubtful. Additional articles appeared in TAZ (October 4, 2006) and Tagesspiegel (November 27, 2006). Bernard Hummel and Christian Schöningh, both architects, consult ExRotaprint’s project management team (Daniela Brahm, Les Schliesser, Anna Schuster). Bernhard Hummel continuous to support the work of the managing board. November 2006 – Contact with GLS Bank, which exclusively finances projects focused on socially oriented goals and sustainability; following personal discussions GLS expresses clear interest in getting involved with the project. November 2006 – Consultations with external advisors on credit volumes, financing, and business models. November 2006 – Additional letters are sent out to responsible parties in the Senate, House of Representatives, and to the district urgently requesting the site be withdrawn from the package sale. December 2006 – Direct consultation in the House of Representatives by ExRotaprint’s managing board with individual politicians serving on the responsible committee. December 27, 2006 – District mayor Dr. Christian Hanke learns about the project while on-site and pledges his support. January 10, 2007 – The representative from the Icelandic real estate investment group tours the site accompanied by his advisors and other representatives from the Liegenschaftsfonds. We explain to him our own plan to take over the property, hand out material, and object to his plan to develop high-income bracket lofts in the neighborhood. January 10, 2007 – Dr. Flierl learns about the project while on-site and pledges his support. January 15, 2007 – City development committee hearing chaired by Dr. Flierl. Wiesenstr. 29 is used as an example to portray the value of both sites to city politics as locations for studio spaces, businesses, and community outreach organizations. The protected status of the site is emphasized, particularly in view of the fact that the Senate would be responsible for costs related to site clean-up as a result of any eventual tear down by investors. January 2007 – In addition to Dr. Hanke and Dr. Flierl, Florian Schöttle, the BBK Atelier Representative, and District City Councilor Ephraim Gothe also count among our supporters. January 1, 2007 – We outline in an initial feasibility study how the necessary restoration work and a loan can be serviced with the target rents. January 2007 – Approval of the LSK Micro-project grant from the Bezirkliches Bündnis für Wirtschaft und Arbeit (District Alliance for Economics and Jobs) with the target goal of “developing the project for implementation” by September 2007. January 25, 2007 – At the association meeting, project manager Jörg Mauer and architect Bernard Hummel present to tenants their work goals for the upcoming months. February 13, 2007 – Les Schliesser, Daniela Brahm, and architect Bernhard Hummel present the project to Mr. Wieland (SPD), head of the main Budget and Finance Committee of the Berlin House of Representatives. 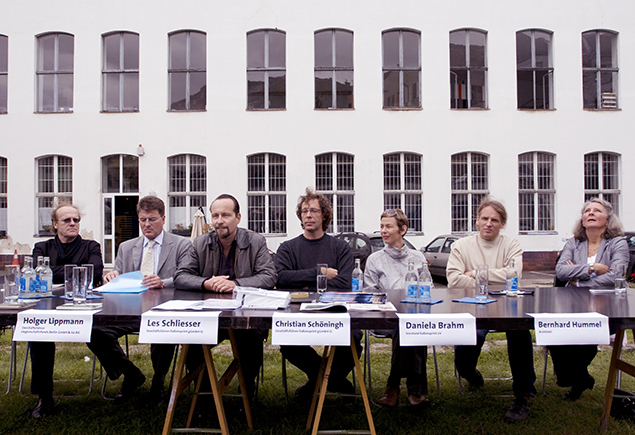 February 20, 2007 – Press announcement by Dr. Flierl (PDS) on the Senate’s decision to withdraw the properties at Gottschedstraße 4 and Wiesenstraße 29 from the Liegenschaftsfond’s package sale. Stipulated is the transfer of both properties back to the district, and their fiduciary management by the GSE until the sale to the user-initiative. February 22, 2007 – Excitement during the association meeting regarding the withdrawal of Rotaprint from the package sale. Feb. 2007 Application for a loan from GLS Bank for the purchase of the site. February 23, 2007 – Final presentation of the Real Estate Management degree program, TU Berlin. Presented are concepts for sustainable development and uses for the former Rotaprint site in Berlin’s Wedding district. The Liegenschaftsfonds and the managing board of ExRotaprint meet for the first time since the breakdown in negotiations. March 16, 2007 – In reaction to the district’s press announcement of February 20 on the transfer of the Rotaprint property to its assets, the Senate Finance Committee stipulates that the district must hold onto the property, thereby raising the next hurdle. While the investors from “northern Europe” continue to better their offer, solutions involving the initiative are upheld and after being fulfilled—also by the district with the request of transfer—again fall through. In addition to Bernhard Hummel, architect Christian Schöningh also gets involved in the process. April 26, 2007 – The Liegenschaftsfonds finally enters into sales negotiations with ExRotaprint. While still on the phone, Les Schliesser proposes to buy the site for the same price that was quoted by the Icelandic investment fund in their real estate package for the former Rotaprint property (600,000 euros). May 15, 2007 – First day of negotiations. The managing board of ExRotaprint and the Liegenschaftsfonds agree to a three-month moratorium, at the end of which the contract will be signed. May – June 2007 – The managing board of ExRotaprint approaches the Stiftung trias about a potential collaboration. The Stiftung trias, in turn, contacts the Stiftung Edith Maryon. Following numerous on-site visits and many discussions, the foundations elect for the first time to work jointly on a project. ExRotaprint decides against taking out a bank loan and finalizes the cooperative arrangement with the foundations, whose stated missions rules out property speculation. The managing board of ExRotaprint negotiates all aspects of the sale with the Liegenschaftsfonds and forms at the same time a heritable building right agreement with the trias and Edith Maryon foundations. June 14, 2007 – The association decides unanimously, with one abstention, to establish the nonprofit organization ExRotaprint gGmbh to take over the site by means of heritable building right. July 17, 2007 – Founding of the non-profit ExRotaprint gGmbH. Seven on-site tenants, two outside parties who are not tenants but are enthusiastic supporters of the project, and the tenants’ association, ExRotaprint e.V., become founding partners of ExRotaprint gGmbH. September 3, 2007 – The site is sold to Stiftung trias and Stiftung Edith Maryon. At the same notary public appointment the foundations sign a ninety-nine-year heritable building right agreement with ExRotaprint gGmbH. ExRotaprint gGmbH is now the owner of the buildings on the site of the former Rotaprint factory and is solely responsible for project development.